Friday August 21st 1925 Was busy sewing in AM. Laura went to Peoria. In the afternoon went out to Baldwins by invitation to Missionary meeting. Mr Ashren took us a wonderful ride later. Mr Albers took us to cemetery. Saturday August 22nd 1925 Busy in my own room all forenoon. Mr Albers took me over to Lizzie Duncans. Carl brought me home. I had letter from Hattie. I sent special delivery reply. Sunday August 23rd 1925 I read some in morning. Harry and Mabel came but were obliged to start back late in afternoon. We spent the evening on the porch. 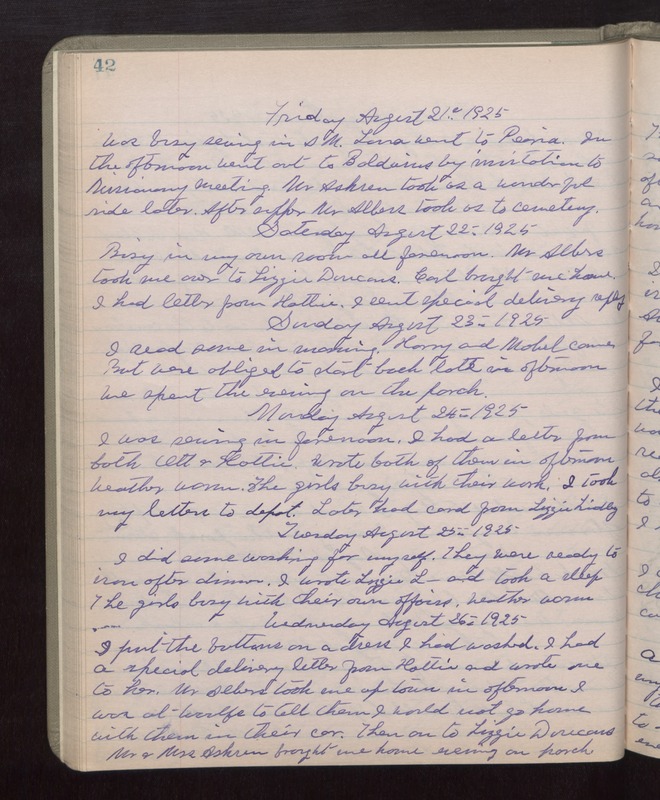 Monday August 24th 1925 I was sewing in forenoon. I had a letter from both Ott & Hattie. Wrote both of them in afternoon. Weather warm. The girls busy with their work. I took my letters to depot. Later had a card from Lizzie Lindley. Tuesday August 25th 1925 I did some washing for myself. They were ready to iron after dinner. I wrote Lizzie L--- and took a sleep. The girls busy with their own affairs. weather warm. Wednesday August 26th 1925 I put the buttons on a dress I had washed. I had a special delivery letter from Hattie and wrote one to her. Mr Albers took me up town in afternoon. I was at Woolfs to tell them I would not go home with them in their car. Then on to Lizzie Duncans. Mr & Mrs Ashren brought me home. Evening on porch.